Fresh example of violent mentality of BJP. 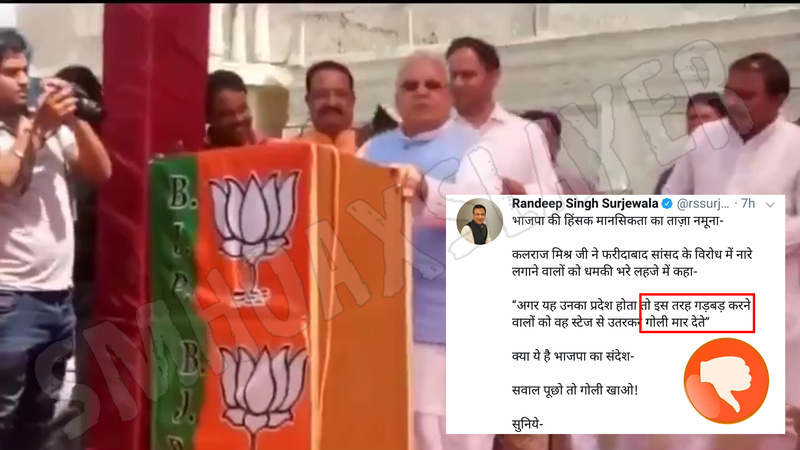 Kalraj Mishra Ji threatened people who rose slogans against Faridabad MP. Is this the message of BJP ? You’ll be shot down on asking a question ? Randeep Surjewala wrote it wrong. It wasn’t a threat of shooting a bullet. “Elections has to be fought but its not a bench mark. He posted the same speech shot from a different and closer angle which has much clear aisii. ← RJD uses a Pakistan’s photo claiming as Ganga’s to target PM Modi.